The chief priests and the Pharisees secured the tomb, putting seals on the stone and mounting a guard. What for? Ostensibly to prevent anybody from stealing the body of Jesus. Or could it be to prevent Jesus from rising from the dead? The Bible says that “Fools say in there heart that there is no God.” When men choose to fight against God or kick against the goad, they behave like fools. “For they do not know the scripture or the power of God.” According to the scriptures, Jesus would rise on the third day. Could this be prevented by man? Lord, grant us a deepened faith and awe in the Scripture and the power of God. Listen to Jesus the faithful witness. "The Spirit God has given us is no cowardly spirit, but rather one that makes us strong, loving and wise." Goethe, the eminent German philosopher once said, "Be bold and mighty forces will come to your aid." Norman Vincent Peale agreed: "Boldness is the activator of power from the mind." Can we display true boldness without the power of the Holy Spirit?Because we face so many trials when we commit ourselves to the Lord, we sooner or later realize that courage is central to the Christian life. Without courage, how can we stand up for Christ in our homes? Even our spouses and kids may challenge our committment to the Lord. Our workplaces are full of temptations to our Christian values. How do we cope with these traps? How do we react to the many snares of the enemy in the workplace? And the Church?As we grow daily in the knowledge and love of Jesus, our model and example, we learn to apply the truths of the Bible to our daily lives. Delays, disappointments, obstacles, suffering and persecutions can cause extreme discouragement. We take comfort in the cry and prayer of Christ, ‘My God, my God why have you deserted me?” Even Jesus felt deserted under intense suffering. But we also must learn by his grim determination not to be discouraged, to drink the cup of suffering to the last drop. This attitude of firmness and steadfastness in face of overwhelming odds is itself victory. We learn this in the school of prayer, the school of Gethsemane. In Gethsemane, Christ prepared for what was to come in the following 24 hours. The time we spent in prayer in the morning prepares us for what is to come in the next 12 hours. Even on the cross, the hatred for Jesus by his enemies was unabated. The enemies of Jesus did not seem to believe that with Christ on the cross, their victory was complete and final. They continued the attack. It is interesting to note that they challenged God to vindicate the trust that Jesus had in him. Scripture is filled with the assertion that those who trust in God can never be put to shame. It is impossible that the chief priests, scribes and elders were unaware of this scripture. For them to say to Jesus, ‘You put your trust in God. God cannot save you in this situation,’ seems to be a contradiction of the truth. The passion of the Christ was the reign of darkness when the father of lies was in control. The next thing to note in the above incident is that the chief priests, the scribes and the elders did not consider it above their dignity to come to witness the execution of their enemy. It reminds one of the small crowd that witnesses the execution of criminals in death chambers. The crowd is made up of the aggrieved family members, the press, a minister, some family members of the criminal and some representative of the government. Some people in the group may be motivated by revenge. The chief priests, scribes and elders on Calvary were certainly there to gloat over Jesus. But Christ was not a common criminal. The insults and taunts and the lifting up on the cross had the foreknowledge of God. God permitted this as an essential condition for our salvation. Everything written in the Bible with regard to the suffering Messiah must be fulfilled. The follower of Christ is called to be a type of Christ. God is training us to be like his Son by presenting us the opportunities to suffer insults, taunts and persecutions for the sake of Christ. The persecutors who provide us the opportunity are unaware of God’s plan. We become empowered to suffer like Christ as we make our home in his word. We perceive this truth and this truth sets us free from the fear of suffering. This is an incredible narrative packed in only 110 words. We see Jesus surrounded by the whole cohort, representing the full assembly of evil. How is it that some people will read the story of Christ’s passion and death and it will move them to lasting conversion and others will read the same story and remain unmoved? How I pray that when I read the gruesome narrative of the passion of the Christ, I will realize that it is my sin and that of others that lead him to this situation. I am taught that this suffering and humiliation of the God-man was necessary in order to assuage the justice of God and save me. Why does this knowledge not move from the head to the heart where it can produce a permanent fruit of repentance? The chief priests, leaders of the people and the crowd chose Barabbas to be freed and Christ to be crucified. What was Christ’s offence? To the chief priest and the leaders of the people, he represented too much of the truth. He spoke too much of the truth. He made no distinction between man and man. They could not reconcile themselves to his message or his person. They demanded a capital punishment. They wanted a final solution to the Jesus problem. Only his death could restore the peace he had disturbed. Now why did the crowd want Jesus to die? The crowd benefited immensely from Christ’s ministry. He fed them, healed them and taught them. At the moment they should stand up and be counted, they abdicated their conscience and judgment to the leaders. They sold their voting rights for a few pennies. In the reign of darkness, anything is possible. The bible warns us not to put our trust in man nor in princes. Only in God lies our peace and security. "My Grace is Sufficient for you"
The Catechism of the Catholic Church teaches that “The witness of Scripture is unanimous that the solicitude of divine providence is concrete and immediate; God cares for all, from the least things to the great events of the world and its history. The sacred books powerfully affirm God’s absolute sovereignty over the course of events.” (CCC #303) When Jesus said to Paul, “My grace is sufficient for you, for power is made perfect in weakness” Christ was affirming the power of divine providence over all circumstances. When Christ foretold Peter’s denial, Peter did not believe the Lord. Jesus is all-knowing. He knows our past, just as he knows our future. He knows our strengths and our weaknesses. He creates our opportunities and permits our threats. So you better believe him when he tells you something. He speaks to us everyday through his word. Jesus told Peter that the enemy had been given permission to test him. Christ has prayed for Peter. In spite of the prayer, Peter will fall. But after the fall, Peter will rise again. Peter’s experience of sin will make him stronger and more compassionate in his task of leading the other disciples and Christ’s flock. Peter could say of his sin, ‘O happy fault.’ Out of sin rose compassion; out of death rose beautiful life. The Holy Spirit says: “For those who love God, all things work together for good.” (Romans 8: 28) Yes, all things including sin! The midnight interrogation of Jesus was not a gentle process. It was a period of accounting between the Christ and Satan and the advantage was clearly the devil’s. In an irrational frenzy, everybody turned against Jesus. It was as if there was a competition to see who would deliver the deadliest blow. But Jesus had predicted his passion to the letter. He had also said somewhere else that “Those who belong to me will listen to my voice.” The crowd here does not belong to Jesus. Their reaction to the Truth was violence. They spat on his face; they hit him with their fists; they struck him as they insulted him. The evangelist recorded that Jesus was silent during this ordeal. O that I could learn the golden rule of silence during insults and persecutions! Paul endured the same persecution. Peter urged us to be happy at such occasions. Christ warned us explicitly to be prepared for it. Two thousand years of church history has vindicated this wisdom that there can be no crown with cross, no victory without victimization and no testimony without tests. Man has yet to discover how to made omelet without breaking eggs. This is the supreme moment of test for the Christ. What can we learn from this? Dignity and silence under trial. This is impossible without God’s grace. Many After Communion prayers say: “Lord, strengthen us by the sacrament we have received.” We receive the strength from Holy Communion to imitate Christ. The passion of the Christ begins. The reign of darkness is set in motion. The Truth becomes a blasphemy to the chief priest. Jesus is well prepared for this moment of crisis. He has prepared for this time all his life. But at Gethsemane he prepared for it intensely and proximately. This reminds me of a great word I heard in a recent parish mission: “Life is a journey and not a series of events.” Every step in this journey and every moment of this journey counts towards the final scene. This is the final act in the life of Christ. This drama started with his birth in a stable on Christmas Day. The child is the father of the man. It is as if we see the cross looming over the nativity scene. What does all this mean for us? Every step and every moment of our life’s journey prepares us too for the final scene. If we take every step with the end in mind, we prepare well. Christ’s passion, death and resurrection are all in accordance with God’s plan. The intervention of Peter with a sword during the arrest of Jesus was unnecessary. The unfolding events are all in line with God’s purpose. If they are not, God will intervene himself. What is the message in the above scripture? God’s plan, purpose and decision for the world are sacred. We must trust God’s disposal of events. The scriptures contain a record of God’s plan and purpose for the world. The plans will unfold according to the time-table set for them by God. Like Daniel, we must search the scriptures to discover God’s plan for our lives. Why were the apostles sleeping on such a unique occasion? What was the cause of their physical and emotional exhaustion? Was it just the Passover meal and the wine? It was probably an attack of the enemy. The devil chooses his point of attack very carefully. The passion of the Christ was the period of the reign of the powers of darkness. The experience of the Christ in Gethsemane teaches us a number of lessons. Each of us must go through our own passion from time to time. Any part of our ecosystem or comfort zone may come under attack. It could well be that all the zones are under attack at the same time. What do we do when this is the case? First of all, if we are able to recognize what is happening, we have won half the battle. Jesus gave us here the effective weapon: keep awake and pray. The Catechism of the Catholic Church has this to say on prayer: “Prayer is a vital necessity. Proof from the contrary is no less convincing: if we do not allow the Spirit to lead us, we fall back into the slavery of sin. How can the Holy Spirit be our life if our heart is far from him? Nothing is equal to prayer; for what it impossible it makes possible, what is difficult, easy…For it is impossible, utterly impossible, for the man who prays eagerly and invokes God ceaselessly ever to sin. Jesus predicted his future to teach his disciples to trust him completely with their own future. He was their friend and leader for three years and he understood that the shock of his passion and death would be too much for them to bear. He knows the strengths and weaknesses of man, so he took time to prepare them for the grim events that would follow shortly. This prediction and fulfillment will form the faith of the disciples. It also forms our faith in the omniscience of Jesus. We trust him when we trust his word. We trust him when we surrender our future to his lovable and all-powerful providence. She heard, she pondered, she believed! All her life, Mary prepared herself to say 'yes' to God. Through Mary's 'fiat' or yes, Jesus became physically formed in her womb. The Annunciation is the celebration of the robust faith of Mary. Mary becomes the model for our true vocation in life. Whoever hears the word of God and ponders it in his heart everyday becomes disposed for God's action. Of the incarnation, St Augustine and St Leo said that Mary conceived the word of God first in her heart and then in her body. Pope Leo XIII in Encyclical, Octobri Mense wrote: "The eternal Son of God, about to take upon himself our nature for the saving and ennobling of man, and about to consummate thus a mystical union between himself and all mankind, did not accomplish his design without obtaining the free consent of her who was to become his Mother. She was the representative of all mankind, according to the illustrious and learned opinion of St Thomas, who says that 'in the annunciation was awaited the consent of the Virgin standing in the place of humanity.'" The blood of Christ seals the new covenant between God and man. The new agreement between God and man is this: Jesus agrees to die for the sin of man on the cross. Man agrees to accept the sacrifice of Jesus for his salvation. To seal this agreement, man eats the flesh of Jesus and drinks his blood. Whenever we eat his body and drink his blood, this covenant is renewed. The Church calls the Eucharist, a great mystery of faith. We can never fully understand this mystery. But then understanding is not important, believing is everything. In dying on the cross, Jesus saved us. In giving us his body and blood as the sign of this wonderful covenant, he saves us today. Thank you Jesus for your precious Body and Blood. I stood near the historic Arc de Triomphe in downtown Paris, dazzled by the brilliant lights and savory smells of the French capital. Well-dressed men strode liesurely and women in the latest fashion walked in the famous Parisian catwalk. BMWs and Mercedes whirled the huge roundabout. What a spectacle! I couldn't help myself. I indulged in reverie. This is great life and I wanted it. Great family, big salary, nice homes, fast cars and overseas vacations. For many years, I went the extra mile in search of the good life. Then I met Christ. Before St. Paul met Jesus, he boasted about his many 'physical qualifications'(Philippians 3:3): He was a Jew, a Pharisee and educated by Gamaliel. After his conversion, Paul wanted only one thing in life: to know Jesus and to serve Him. What do you value as your greatest asset? Jesus said: "You cannot serve both God and money" (Matthew 6:24). An encounter with Jesus causes metanoia, a Greek word signifying a radical change of direction. Commitment to Christ changes our values and removes our longing for wealth. He shows us true riches: Faith, hope, love, simplicity and joy. Knowledge of Christ opens the door to trustworthy fortune. Our happiness no longer depends on material things. We become aware that Jesus who loves us, knows our real needs and provides adequately for us. Moths, rust and robbers threaten worldly riches but cannot touch spiritual wealth. Our fortune is stored in heaven. A street woman shows lavish affection to Jesus. The host who noticed it murmured inwardly. Jesus did not hesitate to claim his right to be loved and for fair treatment. “Give to Caesar what is Caesar’s and to God what is God’s.” There should be not conflict between and our love and service to the poor and what we owe to God. We owe Jesus a continual sacrifice of praise, thanksgiving and love. How do we discharge this duty? “If you do it to one of the least of my brethren, you do it to me.” Jesus is present in our neighbors especially the marginalized and the weakest. Lord, help us to recognize you in our brothers and sisters. The good and faithful servant is praised not for the achievement of great projects but for accomplishing small tasks in a faithful manner. This means that everybody can be a good and faithful servant. Even a child can perform a small task. It is relatively easy to accomplish a small task once. It is much more challenging to do it for one week or one month. But to do that small thing always and everywhere demands a cut above the average. This is the quality of faithfulness. God has given everyone the ability to do something well. This is our talent or opportunity. God wants us to be faithful in the use of this talent. Many writers have pointed out that what is most encouraging in the above scripture is that the servant is praised not for performing the task in an excellent manner but just by being constant in his line of work. It is comforting to see that I too can be faithful in one thing. What is the one thing I can be faithful in? Perhaps prayer or the study of the word of God. I find a natural attraction to both. : This is the parable of the foolish virgins. The parable teaches perseverance and staying power. Sometime ago, I had a horrible dream. I was in a large Church with many people waiting to receive certificates from the bishop. When the bishop delayed his arrival for over an hour, I left the Church to go to my apartment across the Church to comb my unkempt hair. I have a clean shaven head but in the dream, I had a full head of hair. When I arrived in my apartment, I met unexpected distractions. When I came back to the Church, the ceremony was over and I missed my certificate. I wept like a child in the dream. The faithful and wise servant is constant at his post, unwavering in his duty. He knows what is expected of him and he does it come what may. He has his job description and work plan and he understands what is expected of him. His is not a man of eye service. To understand the job that the Lord has for us. To be faithful and constant in doing this job. To believe in the promise of the Lord to reward our diligence. Lord, grant us the above graces. Amen! The message is simple and clear: stay awake and stand ready at all times for the coming of Christ. Do not take chances. Do not take any risks at all. Avoid unnecessary distractions. You may be tempted to think: but I must work to put bread on the table. I must get married or give my daughter in marriage. I have responsibilities that cannot wait. What are the signs of the tines today? Wars and rumors of wars. Acceptance of gay culture everywhere. Challenge of Church authority. Few vocations to the priesthood and religious life. Diminishing Mass attendance on Sundays. Failure to keep the Lord’s Day holy. Increasing number of divorces and breakdown in family life. Failure to keep sacred vows made to God. These are some of the signs of the times. These are signs that the hearts of men are growing cold. The word of God helps us to match its prophecies and predictions with what we observe around us. We pray and are vigilant so that we can recognize these signs. Lord, explain your words to us and grant us faith in your word. When Christ came the first time, it was in a humble and dependent state. When he comes the second time, it will be in great glory and power. When will Christ come to gather the chosen from the four corners of the earth? Nobody knows. When will he come to gather me up? It may happen sooner rather than later. My life today should be a preparation for the coming of Christ to take me home. How do I prepare for this imminent event? I prepare by prayer. “Watch and pray for you do not know the hour.” I prepare also by the study of the word of God. I prepare by doing the work that Christ has given me to do today. Lord Jesus, I thank you for your word today. As I wait for your coming to take me home, teach me to listen to your word today and obey it. This is a bleak warning about the end-time period. When the world starts to unravel, people will be desperate looking for any means to save themselves. This period of uncertainty and desperation will be favorable in producing false prophets. What is most astonishing about this warning by Jesus is that he foretells that the false prophets will work great signs and miracles. Many will be deceived by this. Even the chosen will be disconcerted by this phenomenon. But because the chosen had long been anchored on God’s word, they will not be deceived. How will the faithful be able to undress the false prophets? Christ taught that “By their fruits we shall know them.” The true Christians will look for the fruits of the Spirit among the false prophets. Are they patient? How do they handle delays, disappointments and obstacles? How do they cope with suffering? The false prophets will fail these tests. Lord Jesus, grant your people the gift of discernment of spirits, so that we can discern the false and the genuine. Why does the love o f God allow us to pass through so much distress and affliction? “My son, when you come to serve the Lord, prepare yourself for trials. Be sincere of heart and steadfast, undisturbed in time of adversity. Cling to him, forsake him not; thus will your future be great. Accept whatever befalls you, in crushing misfortune be patient; for in fire gold is tested, and worthy men in the crucible of humiliation.” (Sirach 2: 1 -5) God’s adorable and loving providence trains us and saves us through suffering. Without Good Friday, there would be no joy of Easter. Without tests, no material for testimony. God allows his beloved to go through suffering, distress and crisis because these have redemptive value for his us. Our salvation is secured through suffering. We become strong and courageous like real sons. Christ Jesus gave us the example. We know that God’s love is embracing us moment by moment even in the midst of distress and affliction. Because God is with us every moment, loving and protecting us, nothing can go wrong, appearances notwithstanding. This is a basic and formidable truth. But how can we prove it? God’s word says so. Romans 8:28. On Good Friday, Christ gave up himself freely to die on the cross for us. In the above scripture, he uses Psalm 22 to pray. Many of the bystanders looking at him believed him deserted by God. But that is the illusion. That is the evidence of the senses, the error of appearances. Jesus prepared adequately in the Garden of Gethsemane for this ordeal. He left the garden assured that God was on his side. We learn from this to prepare for our own hour of ordeal through constant prayer. Prayer helps us not to doubt God’s constant protection by looking at appearances. God is always there protecting us moment by moment. Like Job, we too can understand the meaning of suffering through faith. For the carnal man, suffering is disaster, pure catastrophe. But for the faithful, the cross is the route to supreme victory. God is always a good God. The Warning is for Now! We have heard the warning. We have received the encouragement. Prepare therefore yourself and be always ready. Arm yourself with the word of God, the sword of the spirit. Look at the condition in society today and you will see for yourself that the warning is for Now. Pray at all times so that events will not take you unawares. Scripture teaches us through instruction, encouragement and warning. In the above passage, we see a clear warning on how to look upon the things that the world consider awesome and irreplaceable. Jesus says that these things will not last. This word of Christ has been vindicated throughout history. The great temple in Jerusalem was destroyed in 70 AD as predicted here. The Roman Empire disappeared. The twin towers in New York disappeared. Some other wonders of the world saw their demise at the appointed time and were consigned into oblivion. If these great structures of humanity do not last, what then is durable? The Bible teaches that what is durable and eternal is not seen by human eyes. The word of God will last forever. Love will last forever. We have listened to the warning, what is the encouragement from the above scripture? We can see the world from a supernatural perspective. The encouragement is joy in the thought of everlasting life promised us by God. Freed from the valley of tears, we will live forever in happiness with God. When Jesus founded his Church, he created the positions of bishops and priests to pasture his people as a shepherd pastures his flock. They are to gather them as a hen gathers her chicks under her wings. We refuse to be gathered and nurtured if we reject our leaders, if we mock and tear them down constantly through criticisms. If we persist in this attitude, Jesus may say to us: ‘You refused what I have provided. So be it!” What a terrible sentence! What are the instructions, encouragement and warnings in the above passage? There is a clear warning against the spirit of religion; the spirit of external works which is opposed to real piety. The focus of this spirit is to get the attention and admiration of the world, not the obedience of God. The warning is clear: Avoid these things. “What would you have us do, Lord?” - Love justice and practice mercy and good faith. Go for interior devotion. Lord, help us to understand the difference between grace and works. “My son, if you aspire to serve the Lord, prepare yourself for an ordeal. Be sincere of heart, be steadfast, and do not be alarmed when disaster comes. Cling to him and do not leave him, so that you may be honored at the end of your days. Whatever happens to you, accept it, and in the uncertainties of your humble state, be patient, since gold is tested in the fire, and chosen men in the furnace of humiliation.” (Sirach 2: 1 – 5). Lord, through your word, you grant us the consolation of the truth. You teach us through your word that to serve you is not a constant party. There will be ordeals and disaster will come. You encourage us to be steadfast and patient. It is true that life is full of uncertainties. You know all about these and ask us to abandon ourselves to your loving providence. This message of hope could not have come to me at a better time. Thank you for it, Lord. Grant me the grace to be steadfast in faith and joyful in hope. Christ is the Son of God. He is the second person of the Blessed Trinity. According to God’s plan, he became man for our sake. One of his missions is to reveal further the nature of God to us. Christ is the Emmanuel, that is, ‘God-with-us.” He demonstrated the godly qualities that had been revealed in the Bible: goodness, mercy, compassion, holiness, purity, longsuffering, omnipotence, omni-science and truth. The Christ suffered and was crucified on the cross so that he would free us from the dominion of Satan and make us children of God. Christ founded a Church through which he continues to save men. Today, he is seated at the right hand of God the Father. This is the opinion of believers about the Christ. What is the implication of our faith? If the Christ is truly what we believe him to be, then we owe him adoration, love, obedience and service. What are the things that the Lord commands us to love him above? Some of them are: money, job, family, tools, food and health. These are God’s generous gifts to us. How do we demonstrate that we love God more than these things? We follow God’s will for us in each of these things. What does God expect of us vis-à-vis money, job, family, tools, food and health? God expects us to depend on him totally for the provision of these needs. We show our love for God through a spirit of dependence, trust and obedience. We must also love our neighbor as ourselves. We do to others as we would like them to do to us. Our neighbor needs family, money job, tools, food and good health just as ourselves. Since God is the supreme provider of these gifts, we trust him to provide enough for everyone. We hold in check our natural tendency for ‘dog eat dog’ type of competition. God is all powerful. He is also faithful all the time. These are two attributes of him that we learn from Sacred Scripture. The knowledge that God is all powerful and all faithful can transform our weak faith into a strong living faith. But the ignorance of this truth can keep us in the place of fear and servitude. In scripture, God reveals himself to us. How do we understand scriptures? We can only understand scripture through the light of the Holy Spirit. The Holy Spirit makes scripture a lamp that illuminates our path and a joy to our heart. Caesar represents earthly powers and governments. Christ says that we recognize the rights of earthly powers and governments. Scripture teaches that God installs governments. We are not only to obey them but we are urged to pray for them. We offer to God what is properly his. This includes adoration, worship, love, obedience and service. Is there a conflict? When Caesar wants what belongs to God, the Christian must say no. We must obey God rather than man, St. Peter said. Jesus Christ foreseeing the conflict urges his follower not to fear the person who can destroy the body and can do nothing more. The person to fear is God, who can destroy body and soul in hell. The martyrs of the Church never tried to deprive Caesar of what belongs to him. It was always Caesar who keeps what belongs to him and wants to deprive his creator of what belongs to God. The excuses for rejecting the wedding invitation are: ‘I am busy going to my farm; I am busy tending my business. Don’t you understand that these have greater priority than your wedding?” The whole point of farming and business is to create wealth in order to have a good life. The king is offering this good life during the wedding party to the invitees. There will be rich food and wine. There will be good music, dancing and very good company. There will be a lot of fun for everybody. This is an opportunity that does not come everyday. It is the mystery of the human situation that a man can say no to the invitation of his king, boss and Lord to a beautiful and bountiful wedding. The king and Lord who invites you to his party is the owner of the land for the farm, the capital for your business and your time. The king is determined to go ahead with his party and so he invites everybody at the crossroads in the town. Man cannot derail God’s plan. Jesus Christ was the stone rejected by the empire builders who became the keystone of an everlasting empire. Where is today the empire of Israel? Where is the Roman Empire? Where are other empires of history? All of them are in the dust bin of history. Why was Christ rejected by the empire builders? The simple reason is because he was both a prophet and a teacher. Those who were threatened by the Truth believed that by rejecting and killing him, they can perpetuate an empire of falsehood. But they forgot that “If the Lord does not build the house, they labor in vain who builds it.” (Psalm 127: 1-2). But when the Lord builds the house and is the keystone, the house stands. The Father speaks to us always. He says, ‘go and work in my vineyard today.’ Where is the vineyard? The vineyard is the home, the place of work, the car lot, the shopping center. It is any place where you can be a good neighbor. When we work in the vineyard today, fulfilling one need or the other, we have the joy and happiness of knowing that we are where the Father wants us to be and doing what he wants us to do. Help us Lord to work in your vineyard today with willingness and joy. When I put my faith in God’s word and do not doubt it at all, nothing will be impossible to me. What causes doubt, hesitation and unbelief? First, lack of spiritual understanding of God’s word. Then, when we look at the evidence of our senses which may contradict what the word of God is saying to us. When we do this, we weaken in our faith. Impatience or the desire to see things happen immediately is another culprit. What then is the remedy against weak faith? Through the light of the Holy Spirit, develop a spiritual understanding of God’s word. Rely on this word, stand firm on it, season and out of season. Children are very dear to God. We must love and respect them. We thank you Lord for this teaching on children. Help us to love little children as you love them. What is your attitude to God’s house? Do you regard God’s house a place of worship, a place of prayer? Do you go to God’s house to seek the face of God? It is important to remember these at all times. Christ here fulfills a scripture about himself. God had long established a plan for Jesus. His life and mission is a faithful adherence to that plan, to the will of God for him. This plan was foretold by many prophecies. This particular prophecy presents Christ as king. This is not a worldly king entering his city with a grand military procession. We see rather a humble, spiritual king. This view is consistent with most prophecies about Christ: humble and unassuming. God has a plan for each of us. This plan is unfolding. No matter who we are, the plan of God for our life will have three common elements: knowing God more, loving him more and serving him with all our gifts. “Have pity on us, son of David.” Jesus had pity on them and gave them back their sight. Jesus is the same, yesterday, today and forever. He does not change. Just as he had pity on the blind men and gave them back their sight, so will he come to our aid today when we cry out to him for mercy. But before we can cry for pity, we must meet Jesus. That is the critical point. The only way to meet Jesus today is by faith. How can this be done? Jesus comes to meet us in prayer, in his word and the sacraments. God’s truth heals us gradually through the renewing of our mind. When we read the word of God, pray or receive the sacraments, our mind is renewed. Our strength is renewed like an eagle. The Thesaurus has these synonyms for Renew: breathe new life into, recreate, refresh, refurbish, regenerate, rejuvenate, renovate, replenish, restore, revitalize, transform. What is the result of renewal? We become new man, new creation. To imitate Christ, we must serve people. But what does it mean to serve people? How did Christ serve people? Christ preached the goodnews to people; he taught them and healed the sick. He fed the hungry. When we do the work God has given us, we serve God and people through it. Service is fulfilling God’s will here and now. What is God’s will for us today? To know him more, love him and serve him through our work. We fulfill some of these through prayer, study of God’s word, and doing our share of our daily work. Today I hear Christ foretell about his passion. What does this say to me? Be prepared about what will surely happen. You are warned. Shocking events will take place. If you are prepared, it helps you to absorb the shock. I am the Master of events and in control of every situation. This is why I know of these events. I say to you: be prepared and have confidence in me. As I answer the call to follow Christ, to renounce myself, pick up my cross and follow him, this prophecy of Christ about his passion applies to me as well. The world will oppose me. Am I prepared for this opposition? In this parable, Christ assures us that we have a place in his vineyard. Everybody who is prepared to work is welcome. So stop worrying about job. Christ says to you: “You go into my vineyard too.” He promises to pay you a fair wage. But first, you must go to the market place where workers are hired. Make yourself available through listening to God’s word and doing whatever he tells you. What is your response? This is the invitation of the King. Is it possible to leave all these things behind and follow Christ? Yes, of course. Throughout Church history, men and women, married and single have responded to Christ’s call to become missionaries. Many Christians who have not left home as missionaries, still respond to the call to evangelical simplicity and prove that the above challenge and promise are not in vain. How does Christ fulfill this promise? Missionaries leave their country for the sake of Christ. Wherever they go, they find a new country, a new father, mother, brother, sister and home. When they die, many prefer to be buried in their new homes. Is this not fantastic? This is God’s doing and it is marvelous in our eyes. A rich man is one who possesses a lot of money and every type of property. He gets whatever he wants that money can buy. Christ says here that it will be difficult for him to enter the kingdom of heaven. Why? Because extraordinary wealth is most probably obtained outside God’s will. Such wealth becomes an alien god. The rich becomes attached to it and comes to rely on it instead of on God. Such wealth poses a grave danger to one’s salvation. What does it profit a man to have all the gold and silver in the world for the few years of life and lose his soul for all eternity? What is your attitude to riches and wealth? Do you recognize God as the creator of all riches and wealth? Can you become a conduit for God’s riches for the development of God’s government and kingdom on earth? How much extra baggage are you carrying? Christ promises that the kingdom of God belongs to the poor in spirit. The poor in spirit are content because they have everything they need without carrying heavy extra baggage. What is Christ saying to me in this scripture? He calls me to a life of service, friendship and companionship. He calls me to a life of perfection. In order to benefit optimally from the call of Christ and enjoy it, I must renounce myself and all attachment to material things. I must have the mind of Christ in all things. Lord Jesus, how do I obey the command to sell what I have and give the money to the poor? You keep only around you what you need, no extras, and no storage for tomorrow. Sell the extras and give the money to the poor. Lord Jesus, I have heard your message. You invite me to evangelical simplicity, to poverty in spirit. I accept dear Lord. Grant me the grace to be totally detached from all material things so that I can be attached to you. Teach me to trust you as my ONLY supplier of everything. Lord if you truly call me to a life of evangelical simplicity, I say yes to you. Go ahead and finish the good work you have started. “This is why a man must leave father and mother, and cling to his wife, and the 2 become one body. They are no longer two, therefore, but one body. So then, what God has united, man must not divide.” (Matthew 19: 5 – 6). Marriage is ordained by God for one man and one woman. When a man meets a woman and they get married, God’s unerring direction is at work. In God’s government, there are no accidents. Every action, every event is governed by his love and wisdom. “God is faithful in all his words and LOVING IN All HIS DEEDS,” the psalmist proclaimed. If all God’s deeds are wise, then there is no question of “wrong partner.” Through the apparently “wrong partner”, God is saving us and training us. Help us Lord to see the truth in your divine providence. I have never thought of faith as boldness. But the above scripture says: “Let us be bold…” which in the context means: Let us have faith. When I looked up the word bold in the Thesaurus, I saw among many words the following: audacious, courageous, daring, fearless, unafraid, etc. The opposite of bold is defined as: afraid, cowardly, fearful, timid, weak, etc. Do not worry about money. Have no anxiety whatsoever about money. Be content with whatever you have. If you have much, be content with it. If you have little, be equally content. God promises: I will always support you and be your sufficiency. You will never be embarrassed on account of money. You will always have what you need. Trust in Me at all times to provide. Because God has made the promise and I know that God is true and faithful, I am very bold and confident as I say: “The Lord is my helper in all my financial needs. Why should I be afraid? Nobody can threaten me or embarrass me because of money. This is God’s word and it is true. If I believe it and do not doubt at all, everything becomes possible.” (Matthew 21: 21). “You wicked servant,” he said ‘I cancelled all that debt of yours when you appealed to me. Were you not bound, then, to have pity on your fellow servant just as I had pity on you?” (Matthew 18: 32 – 33). The wicked servant was handed over to be tortured until he could pay all his debt. And Jesus added that our heavenly Father will deal with us in similar manner if we do not forgive each other. How will you feel if you receive a letter from your bank or Credit Card Company and the content reads like this: “We are happy to inform you that with immediate effect all your credit card debt, your mortgage and all your loans have been cancelled. You are now completely free of debt.” For many of us, the joy might be too much to bear. Yet this is what God has done with our debt of sin. He can also do this with all our debt. But God demands something in return. He demands that we do to others what he does for us. In this parable, we see that what others owe us is miniscule compared to what we have been forgiven. Thank you Lord, for this lesson. You have forgiven me so much. I pledge to forgive anybody who has offended me in any way. In this text, Jesus gives us a new standard for forgiving those who wrong us. The standard is God himself. With him, there is no limit to forgiveness. He is infinitely merciful, compassionate and ever-forgiving. Jesus is inviting us to behave like himself, like God. Whom do we need to forgive? Spouses, children, siblings, relatives, friends; those who cheat us; those who persecute us. The theme of forgiveness is so important that it is a condition for getting God to grant our requests. Jesus included forgiveness in the Lord’s Prayer. We need the Holy Spirit to be able to forgive completely. Jesus, I have heard your word today on forgiveness and I accept your teaching. I forgive anybody who might have offended me in any way. I pledge always to forgive. I need your grace to be able to do this well. Christ is the shepherd who has the 100 sheep. Once upon a time, I was the one lost sheep. Christ searched for me until he found me and brought me back. When he found me, he was very joyful. I am called today to be a shepherd to one lost sheep. What Christ did for me I will do for the one lost sheep. Where will I search for the one lost sheep? Lord Jesus, give me a burden for the one lost sheep. Equip me with a merciful, compassionate and patient heart until I find the one lost sheep. If we cannot trust God in little things, how can we trust his promise in bigger things? How can we trust his promise of eternal life? “The person who is trustworthy in very small matters is also trustworthy in greater ones; and the person who is dishonest in very small matters is also dishonest in great ones.” (Luke 16: 10). Saint Martin de Porres was born in Lima Peru in 1579 to a black mother and a Spanish gentleman. He first entered the Dominican Priory in Lima at the age of 11 as a servant. Later, he applied to be accepted as a lay brother since he could not apply for the priesthood because of his color. He was trained as a pharmacist and soon used his gifts and talents to heal both humans and animals. He lived such a life of heroic sanctity that even while he was alive, many miracles were attributed to him. After he died, he was famed as a miracle worker. The legend of St. Martin de Porres came with the Dominican missionaries to Vietnam in 1527. The Portuguese explorers were the first Europeans to arrive in Vietnam in 1516. As the Dominican missionaries evangelized the people of Vietnam, they introduced them to the cult of their confrere, Martin de Porres, whose fame as a helper in extreme cases had spread all over the world through the Dominican missionaries. The cult of St. Martin de Porres exploded after Martin was officially canonized a saint in 1963. As a young boy growing up in my native country Nigeria, I had chosen the name of Martin de Porres as my confirmation name. Vietnam has a large number of Dominican institutions made up of convents, seminaries, schools and parishes. These institutions were a fertile soil for the cult to flourish. The masses of Vietnam saw in Martin one of their own and an ever present help in their seemingly stubborn social and economic problems. The people of Vietnam suffered very much during the Vietnam War. They found comfort in devotions to the saint. Some years after the war in 1975, thousands of Vietnamese fled their home land for America. They prayed fervently to St. Martin to take them to America and many such prayers where answered. The Vietnamese never forgot this favor when they settled in the US. What does St. George, St. Joan of Arc and St. Martin de Porres have in common? All are patron saints of three countries: England, France and Vietnam. Great legends have spun around their lives. Carl Jung writing on mythology said, “Myth is the revelation of divine life in man. It is not we who invent myth; rather it speaks to us as a Word of God.” (Memories, Dreams, Reflections). Although St. Martin was already popular in Dominican establishments in the United States, the coming of the Vietnamese brought fervor to the cult of the popular saint. Many people in the US will be aware that the day after Halloween is All Saints Day. This is a solemn feast for Catholics all over the world. November 2 is All Souls Day, when the dead are remembered through Masses and liturgical prayers. When Sister Josephine invited me to attend a Mass in honor of St. Martin de Porres on November 2 at the Vietnamese Dominican Convent, I was certain that she made a mistake about the schedule. I did not believe that any feast other than that of All Souls will be permitted on that day. So I double checked to make sure that something was happening before I left home for the Dominican Convent. It was a Saturday morning with breezy and cool wind. The crowd overflowed the large square in front of the convent with a huge statue of St. Martin de Porres. My experience in the two hour ceremony gave birth to this article idea. On that day, I experienced the transforming power of a legend in the life of a people. November 3 is the feast of St. Martin de Porres. God loves the little ones, the “mere children.” What is Christ’s teaching on little children? Allow the little children to come to me, for it such as these that belong the kingdom of God. Unless you receive the kingdom of heaven as these little ones, you shall not see it. Whoever corrupts these little ones will suffer dearly for it. Do not despise any of these little ones. It is clear that Jesus has a preferential option for little children. What is our attitude to little children? Is it marked by impatience, prejudice and even cruelty? Lord teach us to love little children as you do. "At that time the kingdom of heaven will be like this. Once there were ten girls who took their oil lamps and went out to meet the bridegroom. Five of them were foolish, and the other five were wise “(Matthew 25: 1-2). "As Jesus made his way to Jerusalem, he went along the border between Samaria and Galilee. He was going into a village when he was met by ten men suffering from a dreaded skin disease " (Luke 17: 11-120. The number Ten has always fascinated me. There are ten fingers and ten toes. There are Ten Commandments. Robert Schuller's , in his book, TOUGH TIMES DO NOT LAST BUT TOUGH PEOPLE DO teaches how to count to ten and win. Divine truth is what doctrine is all about. Jesus Christ taught this truth with authority. Even his enemies acknowledged this. I have seen teachers who compromise the truth and weaken their teaching authority. They bring in speculation into their teaching. Why do they do this? They want to appear erudite. They may also want to appear sympathetic to the point of view of their audience. To teach the truth, you must know the Truth, Jesus Christ. St Theresa of the Child Jesus was born in Alencon, France in 1873. As a young girl, she entered the Carmelite convent at Lisieux, where she developed rapidly into a spiritual adult. She burned these words of Jesus into her heart: "Unless you change and become like little children, says the Lord, you shall not enter the kingdom of God." (Matthew 18:3) St Theresa of the Child Jesus modeled her life to that of the little child of Matthew 18:3. This explains her popularity and immense appeal to countless devotees all over the world. She died on September 30, 1897. Her feast day is the 1st of October. "The Doctor of doctors teaches us without the sound of words. I have never heard Him speak, and yet I know He is within my soul. Every moment He is guiding and inspiring me, and, just at the moment I need them, `lights' till then unseen are granted me. Most often it is not at prayer that they come but while I go about my daily duties" ("The Story of a Soul", Chapter 8). Jesus had remained behind in Jerusalem to listen to the teachers of the Law. The incidence teaches us a number of lessons about Mary and Jesus. Mary was not omniscient. She did not know that Jesus was in the temple. Mary also felt acutely the pain of a mother who had lost a son. We admire Mary's patience and perseverance. Jesus already shows a singleness of purpose with regard to His mission even at the age of twelve. The Documents of Vatican II, Lumen Gentium comments: "When the Child Jesus was lost and they had sought Him sorrowing, His parents found Him in the temple, taken up with the things which were His Father's business. They did not understand the reply of the Son. But His Mother, to be sure, kept all these things to be pondered over in her heart (cf. Lk2: 41-51). The desire to write is one of my earliest ambitions. I started the habit of keeping journals towards in the end of my high school and discontinued this habit when I left college. . During my desert experience, I went back to serious journal keeping. There was no particular method to my journal keeping. I tried to jot down something everyday. What are the contents of my journal? Reflections on scripture passages; insights from my desert experience; events that I consider significant during the course of the day. When I have nothing to write, I write down the mundane activities of the day. One habit I would like to form is to review my journals on a systematic basis. Whenever I did this, I have derived some pleasure and sometimes insights from it. Do we need a human guide in our journey of faith? If the Holy Spirit leads and guides us, why should we need a spiritual director? God in His wisdom decided to put His words in a book. Throughout the centuries, God's book, the Bible has given birth to other scriptures or biblettes. Holy men and women who had fed and digested God's word had shared their personal reflections on this word with their fellow men. Some of these works have become classics. Below are 10 books in my reading list. O that I would be able to read all before I leave this earth! We all labor and are heavily burdened with problems of money, health, family, job, cars, etc. Jesus knows us individually and is aware of our situation. He invites us to come to Him to find solution to our many problems. We come to Jesus in the Eucharist. We meet Jesus in the Blessed Sacrament. When the Church gathers in prayer in His name, He is there. When we accept the word of God with faith, it changes our lives and our circumstances. "My God, in your creation of this world you made all things to be very good. I thank you, Lord, for all the goods of this world, and especially all those who have provided for me and my loved ones. But remind me, Lord, that only you are the true Good, and that all earthly goods are but shadows of you. And should I become very attached to any fleeting good, and let it obstruct my love for you, grant me the holy desire to have it taken from me. Through Christ Our Lord, the King of glory who has no pillow to lay his head. Amen." Listen to Jesus Christ, the faithful Witness. "Set your mind on God's kingdom and His justice before everything else, and all the rest will come to you as well. So do not be anxious about tomorrow; tomorrow will look after itself. Each day has troubles enough of its own." "I am the way, and the truth, and the life" (John 14:6). St Jerome wrote: "Ignorance of Scripture is ignorance of Christ." I have listed below ten out of hundreds of scriptures that have provided me with healing truths. As St Paul tells Timothy: "All Scripture is inspired by God and is useful for teaching the truth, rebuking error, correcting faults, and giving instruction for right living, so that the person who serves God may be fully qualified and equipped to do every kind of good deed" (2 Timothy 4: 16-17). These scriptures have helped me to gain victory in life's big battles. 6. "Bless Yahweh my soul, from the depths of my being, his holy name; bless Yahweh, my soul, never forget all his acts of kindness. Is there a link between sin, suffering and salvation? Sin brings suffering and deprives us of the abundance and affluent life that God had planned for us. Our sufferings if accepted can be redemptive and lead us to God. There is a mysterious link between sin, suffering and salvation. Deepak Chopra wrote in his book, "CREATING AFFLUENCE": "Affluence is the experience in which our needs are easily met and our desires spontaneously fulfilled. We feel joy, health, happiness, and vitality in every moment of our existence." What does Christ say about affluence? Jesus made a contrast between genuine riches and material wealth that can rust and be stolen by thieves. Who are the saints? These are holy men and women who had patterned their lives after the life of Jesus. They practiced the teachings of Jesus Christ. Their example is relevant for us today. They show us that in every age and culture, it is possible to imitate Jesus. We learn a great deal from the study of the lives of the saints. These men and woman inspire us by their heroic lives. Their reward was rich in faith, love, hope, peace and tranquility during their lives and after death, they inherited everlasting life. "But put on the Lord Jesus Christ, and make no provision for the flesh, to gratify its desires" (Romans 13:14). We "put on" Jesus in baptism (Galatians 3:27). After we have been configured to Christ through baptism, frequent reception of the sacraments, particularly the sacrament of reconciliation molds us into the image of Christ. St. José Maria Escriva writes: "Put on the Lord Jesus Christ', says St Paul to the Romans. It is in the Sacrament of Penance that you and I put on Jesus Christ and his merits" (The Way, 310). "But you are the chosen race, the King's priests, the holy nation, God's own people, chosen to proclaim the wonderful acts of God, who called you out of darkness into his marvelous light" (1 Peter 2: 9). Mary heard explicitly the prophecy of the part she was to play in the life and death of the 'suffering servant of Yahweh.' The sword which would pierce the heart of Jesus would not spare that of Mary. 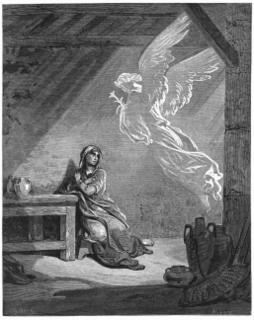 Mary must have repeated her words at the annunciation: 'Behold the handmaid of the Lord. Let it be done to me according to your word." The Church expounds in The Documents of Vatican II (Lumen Gentium): "When Mary presented Jesus to the Lord in the temple, making the offering of the poor, she heard Simeon foretelling at the same time that her Son would be a sign of contradiction and that a sword would pierce the mother's soul, that out of many hearts thoughts might be revealed" (cf Luke 2:34-35). Why should Christ Jesus be a sign of conflict instead of agreement, a sign of dissension instead of corroboration? Why would the gentle Lamb of God, the Prince of Peace be a sign that is opposed everywhere? Look at the cross! Has the cross not always been a sign of conflict, denial and opposition? Always and everywhere? Jesus Christ sees his mission as divisive, that is, a sign of contradiction. The Holy Spirit warns the Church not to conform to the world. The temptation is always there for the Church to think that if she conforms to the world, her message will be less divisive and therefore more acceptable. 2000 years of Church history has not validated this thinking. God provided us with prayer as one of the tools to help us achieve our life's purpose. Jesus' teaching on prayer is precise. What are the lessons from Jesus' teaching on prayer? * Prayers of petition show our dependence on God as supreme provider of all good things. It is a very important subject to Jesus. * Jesus committed Himself that prayers in His name will be answered. What are the conditions for appropriating Christ's promises on prayer? 1. Listen and understand what God's word is saying to your need. 2. Believe in God's promise. 3. Obey the word, i.e. act on the word.